Welcome to the official Contractor Critiques Page! Stay tuned for honest product reviews that readers trust and companies love! Disclaimer: I received free product in exchange for an honest review. Do you have a need for speed? In between your busy morning routine and your frantic nights, your answer is: obviously. Hotheads' new speed brush collection cuts drying time in half! Are you tired of tossing your hair in a ponytail in an effort to get out of the house every morning? I know that I am. Cut your drying time in half with Hotheads, the premier hairbrush line developed by stylists with over twenty years of experience addressing a variety of haircare needs, and their speed brush collection. A favorite of mine and salon professionals, the Speed Brush collection offers the perfect tools for fine, normal, thick, and chemically treated hair. This brush is truly for everyone and every hair type. Made with a 3D bristle pattern, this speed brush also helps for faster heat styling. A mineral compound heats up each brush to a top temperature in as little as eighteen seconds. This helps speed drying time by 50%, leaving you with gorgeous locks in a matter of minutes! This new collection can be used to create volume, curls, or a sleek look. With the wide variety of looks, you can create with this brush, there's little this brush can't do. This brush will not tangle in the hair due to the unique design of the barrel. This is the first brush I've used that has accomplished this successfully. With this brush, you will also experience less damage, leaving your hair with a professional finish. Use the small size for bangs, short bobs, and curling; use medium for shoulder length or longer hair, and use large for very thick hair. This brush is truly ideal for all hair types. You can purchase these brushes here. To contact me, click on the three lines at the top of the page! Disclaimer: I received product for free in exchange for an honest review. Pictures are property of Contractor Critiques. 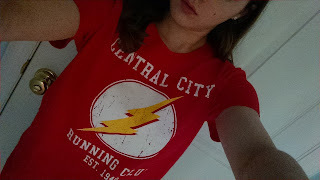 I received three shirts from Textual Tees: You've Cat to be Kitten me right Meow, I'm silently correcting your grammar, and Central City Running Club. With each order purchased, one earns a 10% off code to be used during their next order at Textual Tees. All tees on their website start at $6, or buy 10 tees for just $50. Check out their Facebook and Twitter for tee shirt contests and free shirt giveaways! Today was actually a fairly warm day for winter in my area. I was super excited to go out in just a light jacket. Unfortunately, I do not see this warm weather lasting for much longer. Check out 5 outfits that you can wear on a cold winter day! This outfit incorporates a lot of trends that were popular in past winters. Its definitely got an old school feel. This casual outfit contains all of this winters most popular trends! I really love the vibe that this outfit gives off. It gives off a cute yet independent feel. This outfit also gives off a great feel. I recommend pairing this with the dark makeup trend. So I really love boots! This is a perfect outfit to wear on a day when youre stuck inside. Thanks to bmodish.com for the pictures! Disclaimer: I received these products for free in exchange for an honest review. These pictures are property of Zatik. Zatik offers natural skincare, deodorant, and shampoo.